Seneca Falls, NY. On August 7-9, 2018, Rodman Lott and Son Farms at 2973 Route 414 in Seneca Falls, NY, becomes a showcase of shiny new agricultural equipment for test driving and in demonstrations, fields with new cover crop mixes to beat the summer heat and attract pollinators, Dairy Profit Seminars, beef cattle and horses, farm youth showing their tractor driving and welding skills, and much, much more. Empire Farm Days show hours are Tuesday and Wednesday 9 am to 5 pm, and Thursday 9 am to 4 pm. Admission is free, parking is $10/vehicle. Directions to reach the showgrounds by automobile and airplane, and programming details and schedules are posted at www.empirefarmdays.com. For more information, call 877-697-7837. The demo will highlight methods that reduce odor and runoff and retain nutrient value. Side-by-side demos include dribble bars, grassland tool, disks, shanks. Side-by-side plots with options for dairy, crop and vegetable farmers with single cover crop species as well as mixes of stress-tolerant summer annuals, good combinations for dealing with compaction and adding organic matter, 3 pollinator-friendly mixes, and 4 blends for use after small grain or vegetable crops. Daily plot tour at 10:30 am. Specialist Michael E. Hunter, a Resistance Management Specialty-certified Certified Crop Advisor. • Tuesday-Only: “New Alfalfa Genetics for Forage Quality and Tips for On-Farm Forage Program Consistency” with Alfalfa & Forage Expert Tom Kilcer of Advanced Ag Systems: Registration preferred to www.FGIFieldDays.com; walks-in welcome.
. Changing Times, Changing Consumers: Telling Dairy’s Story. Daily programs on cattle handling system design, animal evaluation, preconditioning, and safe cattle handling. Tuesday-only: Beef Quality Assurance training, 4-7 pm, must pre-register with NY Beef Council, 315-339-6922.
. Thursday: Begin Again Horse Rescue with miniature horses. Feeding for Top Line and Body Condition, Safe Handling of Cattle, Simple Solutions for Electric Fencing, and Worry-Free, Frost-Free Watering. Daily at 10:30 am at Craft Beverage Center with Patty Wakefield Brown of the Finger Lakes Institute and Finger Lakes PRISM, includes how to identify and report Spotted Lanternfly. Visit Farm Bureau Family Education Center, New York Center for Agricultural Medicine and Health (NYCAMH) Safety Center, NYS Grange, and the Empire Farm Days pond for farm family fun activities and safety education. Try a pedal- drive kayak or standup paddleboard on the water! More details on all of these programs, directions, daily schedules, and more are posted online on Facebook, Instagram, and www.empirefarmdays.com. 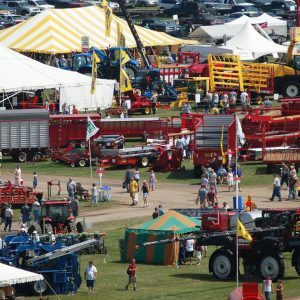 The Empire State Potato Growers started this event as the Potato Field Days in 1931 and have steadily grown it into an agricultural extravaganza with more than 65,000 farmers, agriculturists, and rural living enthusiasts attending each year. Admission is free, $10 per vehicle parking.